Large Pond Filter for Hose. (Push fit) #3DThursday #3DPrinting « Adafruit Industries – Makers, hackers, artists, designers and engineers! Modified and combined a couple of items I found here to create an easier way to drain a clogged up pond using a standard hose that can be submerged to siphon the pond without it getting blocked or sucking out the good stuff, like fish!. Also works with an in line pump to keep larger particles getting into the pump. 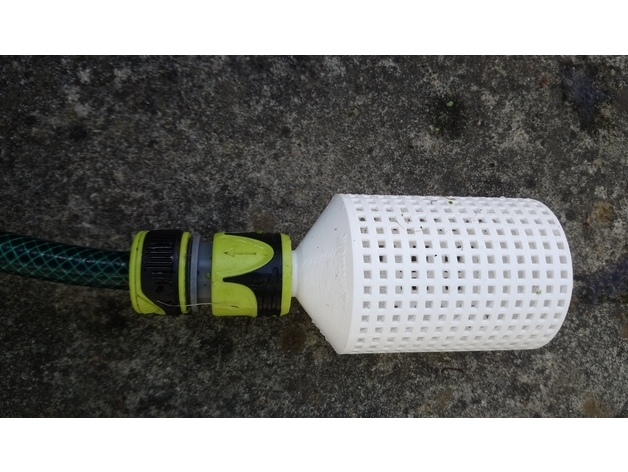 This filter is sized to cope with a fairly overgrown messy pond and worked very well with a 2m head of pressure siphoning a grubby pond without issues. Simply push fits (with added O ring) to existing Hozelock or Gardena systems. Prime, submerge and away it goes.